Measurements: 2.35 x 4.5 inches; or 60 x 115 millimeters. Back of card: Fancy brown & gray 3 dimensional scroll pattern. Can be inverted. Looks too fancy to be original. Booklet included: Yes, 20 pages, 2.3 x 4.4 inches, or 58 x 111 millimeters. 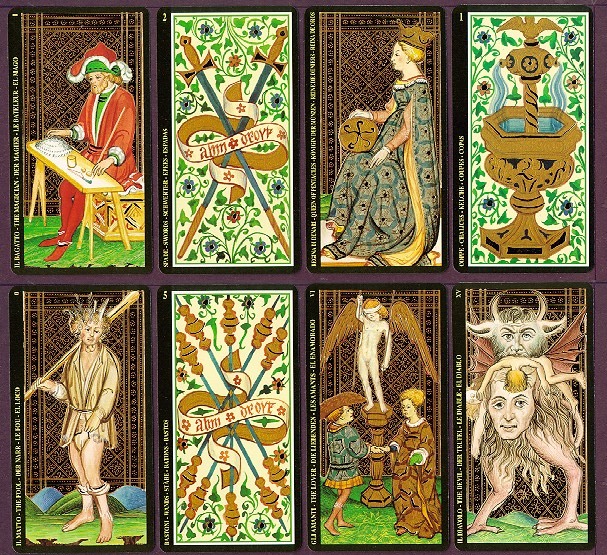 The booklet describes the history of the various Visconti tarot decks & is in English only. Instructions for the cards are on nine extra cards and are in Italian, German, English and Spanish. Publisher: Lo Scarabeo. Printed in Italy. Comments: The Visconti-Sforza were the ruling house of Milan in the 15th century and commissioned a number of tarot decks. These are among the earliest surviving decks. Cards from 16 different decks survive, from single cards to the most complete, the Pierpont Morgan deck, with 74 of the original 78 cards, which is the source for these reproductions. The four missing cards have been reconstructed (among them, the Death card shown above) and all have been restored to produce this splendid deck. As you can see from the cards shown above, these are not old & worn out. On the face cards and major arcana, the restorer has made lavish use of gold foil. A handsome deck, one that repays study.